Not everyone can say that say that a chicken fell on their head. 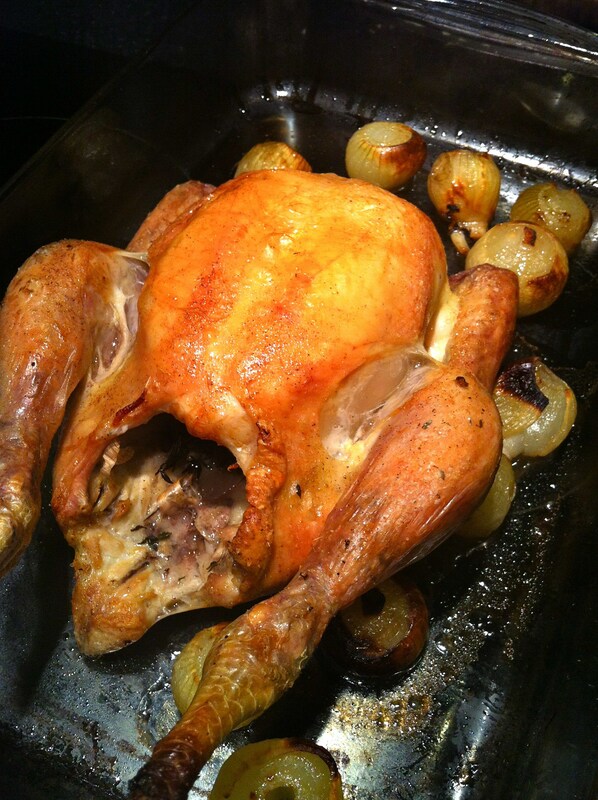 I can of course and it seems like the perfect way to introduce my post about roasting chicken. I’ve been watching a lot of Woody Allen films lately, and anyone familiar with his movies, will know that a chicken falling on my head is a bit of life imitating art in the sense of Woody’s comedic pathos, but I’m no Annie Hall and this was not a lobster. What’s more, I’ve been listening to music from his films, and so my life has felt like I’m on the verge of a committing a crime, in the midst of a romance or just waiting for something funny to happen. The sun rises and falls very low in the sky these days and I’m wearing my coat everywhere. The weather and my stomach seem to be really gearing up for winter. So if a chicken falling on my head is not the perfect opportunity to talk about roasting chickens, then the cold weather certainly is. I think you’ll all agree the hardest part of a roast is the timing. Pulling together all those elements takes practice, but after that it’s easy. I’ve taken to making a roast on Sunday, in the attempts to create some family traditions. And because I’ve got two fussy little eaters, it’s usually chicken, but I have been getting pretty good at roasting a shoulder of pork. I don’t spend a lot of money on my chicken, but I always buy free range. I have always gone by the rule that the smaller the chicken the tastier it’ll be. I don’t stuff my chicken because it just takes too long to cook the meat. I leave my chicken splayed with the cavity well seasoned and littered with thyme and garlic. Removing the trussing lets the chicken cook quicker and gets those legs falling nicely off the bone when it’s time to serve. I have never found this method results in a dry breast, because my chickens are small, everything cooks nicely, in about an hour at 180C (or a touch hotter at the beginning and the end). The most important element of my roast chicken is white pepper and white wine. I season inside and out with lots of salt and white pepper. It makes a difference, the white pepper is more pungent and warming, less prickly than black pepper. I stick the chicken in the tray, breast down with nothing else and let it brown on top (about 15-20 minutes) then I take it out and pour white wine over it. It then sinks and looks ugly, but then I flip it over. That way the breast browns up nicely for serving. I also pour water in when the wine has dried up. While it might mean a soggy bottomed bird, it also means better gravy and no burnt baking dish. Just enough to lightly cover the bottom of the tray. Sometimes I throw in a few pearl onions about half way through, I really love those things. I also put my potatoes (and sweet potato, leeks, parsnips) in at the same time as the chicken. I consider my roast potatoes to be consistenly pretty special. I don’t do anything special, but I think cutting them small enough and using enough oil is the trick. That way they cook quicker and crisp up with no help at all. I recently tried out the Good Natured potatoes with a lovely sample hamper. They send me the pest-free spuds, a jar of goose fat and some Cornish sea salt. I followed their recipe for the perfect roastie. The par boiled, roughed-up texture. It supposedly makes the ultimate roast potato. I have tried this before and not been convinced. Well, I must say, that I think cooking them the old fashioned way works just as well. My son didn’t think much of my fandangled method, but I could tell the difference. They did have that rough texture that is perfect for soaking up goose fat but you know what? I don’t think it’s worth the hassle. The good news is that the Good Natured potatoes really shone through. I don’t think I’ve ever tasted a more flavoursome potato. Ofcourse roasting things in goose fat is never wrong, so I won’t say that didn’t make a difference, but I do think that with the right amount of time, anyone can make good roasties. If you’re wondering how the chicken fell on my head…I had the bird up on it’s end, so I could season it. I dropped my piece of garlic on the floor and as I bent down to pick it up, the chicken fell over, bounced off my head and onto the floor. I was not happy, but couldn’t help but see the funny side it…especially with Woody Allen movie music playing on my kitchen stereo. Oh how fabulous those roast spuds look! ( and the chicken) Could eat them now, even though its only 7.15 a.m. I have tried cooking them with duck fat and they were amazing, but so hard to get duck fat locally! The chicken on the head trick reminds me of the time I took a roast chicken out of oven, burned my hand and dropped it all on kitchen floor. We abided by the 30 sec rule and retrieved it, undamaged! Luckily it was only family around for dinner that day, otherwise it could have been highly embarrassing serving food to guests that had hit the deck! Thanks Lyn…I fear I may have been a little too brutal roughing up my spuds…they lost a little volume in the process.